So many of us have such busy lives, it can sometimes be challenging to find time to volunteer. There are many benefits to volunteering — giving back can help you, your family, and your community. The right match with the right nonprofit can help reduce stress, find new friends, engage with your local community, learn new skills, and even advance your career. Giving your time to others can also help protect your mental and physical health and make you feel good about yourself. The Verde Valley Wine Festival is on the lookout for local residents who are interested in donating their time to help keep the Festival running smoothly. Busy people who want to volunteer but are worried about the time commitment can breathe easy: the Festival is only one day this year. Who doesn’t have time to volunteer for a few hours on one day out of the year? The best part is, you’ll spend a beautiful day in the park showing your support for the area’s winemaking community, and you’ll be helping out two great nonprofits: The Clarkdale Foundation and the Arizona Vignerons Alliance. If you have some free hours on day of the Festival (May 12) and want to be a part of the amazing crew that puts on one of the Verde Valley’s most anticipated events, we have a job for you! 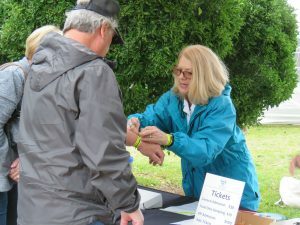 Volunteers receive a commemorative VVWF T-shirt and a wristband that gives them access to the event. So, when you’re done volunteering, you’ll have time to try some of the amazing wines made by winemakers right here in Arizona. To learn more, go to our volunteer registration page and click on the “SIGN UP” button. The VVWF needs volunteers to handle tasks like handing out tickets.